After a hiatus of several years, Active Armor is now again being actively maintained and promoted. It is now available as freeware: go to the Wargaming Machines site to download. The version available there is the latest, and includes all fixes, past and present. A re-write of the system is now being comtemplated, to make it suitable for use on tablets and similar devices. Welcome to Computer-Assisted Wargames Enterprises, the creators of software systems for running historical miniatures wargames. This site allows trial, purchase, and beta-testing of our games systems. We are dedicated to furthering the hobby of historical miniatures wargames with a set of reasonably-priced and high-quality products for making your games play faster, have a higher level of realism, and generally be more enjoyable. Our initial offering is Active Armor WWII, a system for operational-level WWII combat with micro-armor through 20mm miniatures. Each player commands a force from brigade to corps size, with battalions as the basic unit of maneuver. Games can simulate battles spanning a single day or multiple days, and move many times faster than real time. 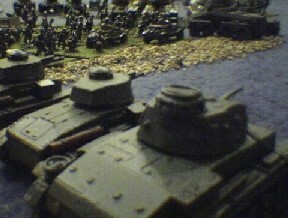 Convention play has shown us that this game is quite easy to learn - the computer handles the details, allowing players to focus on battle tactics and strategy rather than on game mechanics. The game encompasses such factors as air power, weather, and supply in addition to the more usual aspects of fire and maneuver. If you received a copy of the pre-release beta, please go to the Active Armor WWII page to download an update for late-breaking bug fixes. (The link is at the bottom of the page). Future planned releases include a version of Active Armor for post-WWII and modern combat, a mid-war set of scenarios for Active Armor WWII, and an operational-level game for trench warfare in WWI. We are also looking at games for the American Civil War, the Franco-Prussian War, Napoleonics, and Colonials at some point in the future. We hope eventually to create games for the 18th Century, Renaissance, Ancient, and Medieval periods as well. We welcome comments and suggestions, and can be contacted at support@compassistwargames.com. In no sense should our products be taken as an endorsement of militarism of any kind. We are hobbyists and amateur historians, and although we share a deep respect for those who dedicate and have dedicated their lives to their nations' defense, we play miniatures wargames because we find military history fascinating. We do not promote the use of military force as an instrument of policy in any sense. Our products are fundamentally games of strategy, perhaps to be used to explore the "what-ifs" of history, but primarily to provide a few hours of entertainment playing with toy soldiers in a fashion worthy of adults. Don't confuse us with those who build computer simulations for the purposes of predicting real-world military outcomes: this is not what we do, nor what we intend to do. Our goals are education and entertainment. As a friend once said: "Work at peace - play at war." We believe this is a reasonable view, and we try to help our customers do the latter bit more enjoyably.